Dehumidification dryers work differently than conventional dryers. For both systems, air is heated to the desired drying temperature, then circulated over the product to absorb moisture. However instead of exhausting this hot, moist air like a conventional dryer would, a dehumidification dryer draws the air over the cold coil of a refrigeration system. (1) Moisture is condensed from the air and drained away. (2) Air is drawn over the hot coil of the system to reheat. (3) It is then sent back over the wet product. This cycle repeats until the product has reached the desired moisture content. The energy used is only what is necessary to operate the refrigeration compressor, blower, and circulating fans. 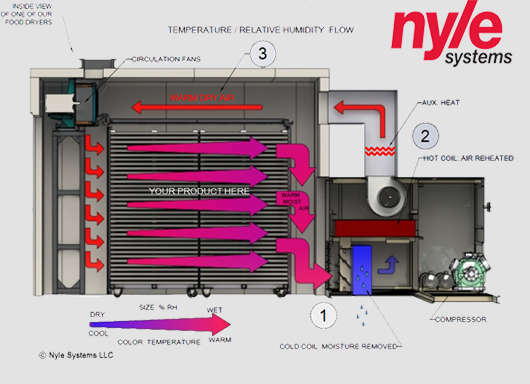 Up to 60% less energy than conventional dryers.